The Remote Services section manages some external services that requires the load balancer system like DNS to in order to be able to resolve network names and NTP to have the system clock synchronized. Every change in this section has to be applied clicking on the Update button. This service is used to resolve the network name for local or global domains. The contents of the configured name servers will be stored in the system file /etc/resolv.conf. Primary Server. The IP address of the primary name server. Default value will be 8.8.8.8 . Secondary Server. The IP address of the secondary name server. This value is optional. This service is used to synchronize the load balancer system date-time clock. NTP Server. The server IP address or name where to connect to get the system date and time. Default value will be pool.ntp.org . This service is used for system and load balancing services monitoring purposes in order to be integrated into a centralized SIEM platform. SNMP Enabled. Check box to enable or disable the SNMP service. It’ll be disabled by default. Physical interface where is running SNMP service. Interface where the SNMP service will be running. Port. 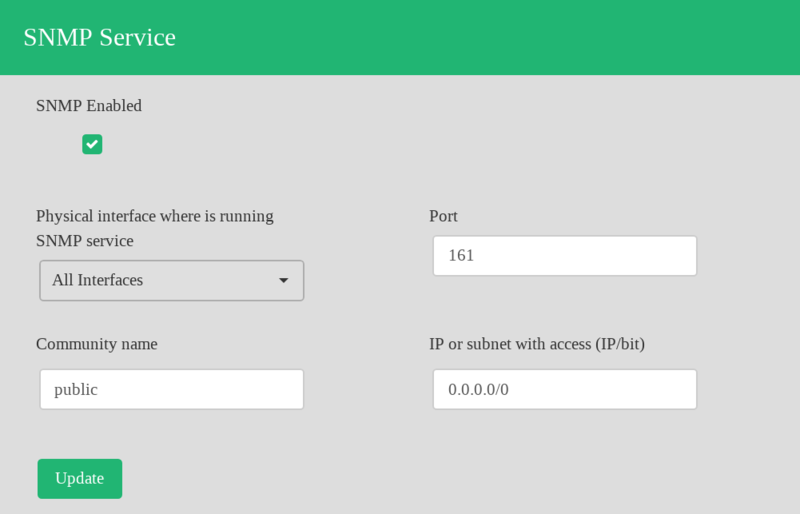 Port where the SNMP service will be bind to. By default the port 161 will be used. Community name. Read only community name to be used. By default, the community name public will be used. IP or subnet with access (IP/bit). Clients subnets or addresses allowed to access to the SNMP service, in case you want to allow the access only from one IP address please use the netmask bit /32. The Update button will automatically apply all the changes to the SNMP service.